This is the restaurant for all occasions. When isn’t ice cream appropriate? Happy or sad, this place never disappoints. It is a little on the pricy side for ice cream, but the ice cream is made there and it comes with all the bells and whistles. I’m a glutton for the crepes. A large serving of ice cream, draped in a freshly made crepe, covered in delectable toppings. How can you go wrong?? The dessert pictured is called A Life Sentence. Peanut butter ice cream underneath, bananas, brownies and chocolate syrup on top. Mmmmm. Just one of many choices on this giant menu. They also have sundaes, waffles, cake, milkshakes and hot dessert drinks as well. My mom is a huge fan of the banana split and gets one every time. It’s not easy to get a review out of someone that doesn’t take breathes in between bites. Due to her silence, I can only assume it’s fantastic. 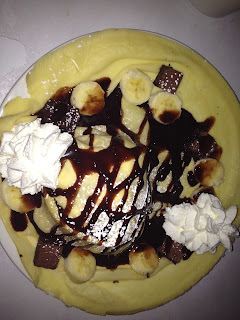 To be honest, it’s hard to get pictures of the food at Demetres. The service is excellent and you are so excited when it arrives, you just dive in. I was lucky to get this picture. These are not small dishes. It is not your average chain restaurant dessert. These are meal sized desserts, so come with an empty stomach and stretchy pants! Desserts will never be the same again! !